The capital of Tibet, at an altitude of 3650m, is situated on the north of bank of Kyichu River, a tributary of the Yarlung Tsangpo river. Lhasa in Tibetan means " Place of the Gods" and Potala Palace, the Residence of Dalai Lama ( The God King), is the earthly representation of the celestial Palace of Avaloketeswora, The Buddha of infinite compassion whose incarnation in the human form is believed to be the Dalai Lama. It is a city truly blessed by the gods where life is unburied. Gyangtse Is a pastoral town between Lhasa and Shigatse. It is 264km South west of Lhasa. 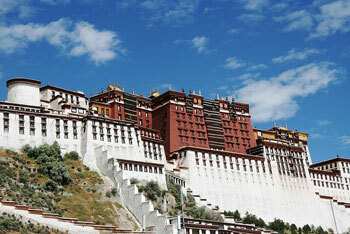 It still retains the charm of a traditional Tibetan town untouched by modern expansion. It made world headlines in 1904 when colonel Young Husband, who led a British expedition to Tibet, defeated the Tibetan army there. As a crossroads on the principle trade route to India, it used to be renowned for the excellence of the carpets. The compound, encircled by an impressive wall, once contained 19 monasterieShgatses, presided over by the still intact fortress Perched a top a nearby mountain. Lies 143km to the southwest of Shigatse, Sakya Monastery, the center of the sakya order of the Tibetan Buddhism, was founded in 1073 by Knochok Gyalpo. During the rule of the Skayapas the priest patron relationship between Tibet and China was established. Sakyapas rulers reigned over Tibet for nearly a hundred years from 13th - 14th century. Many of its priceless images, frescos, statues holy scriptures remaining today date back to the time of its founding. Founded in 1447 by Dendun Drup, the first Dalai Lama. It is the seat of the Panchen Lama who is second to the Dalai Lama in Tibetan Buddhist hierarchy. The 05 the Dalai Lama declared that his teacher, then the Abbot of Tashiliunpo, was a manifestation of the Buddha Amitabha and the fourth in line of incarnate lamas who would hence forth be referred to by the title of Panchen Rinpoche, Tashilhunpo has one of the world's largest statues-a 09 storied gilded bronze statue of Maitriya, of the future Buddha. Situated in the heart of old Lhasa, houses which was brought as a gift by the Chinese princes Wen Cheng on the occasion of her wedding the Tibetan king, Songtsen Gompo. 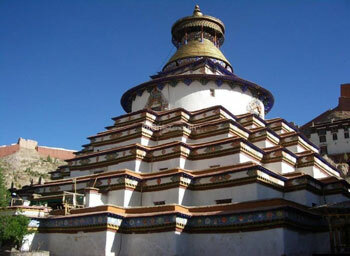 Surrounding the Jolkhang Temple is the bustling Bharkhor market place which is the religious and social focus of Lhasa. Drepung lies 8km west of Lhasa on the main road, then 3km north a steep unpaired road. Its name Drepung Means "Rice Heap ", was the biggest and the richest of all monasteries in Tibet. This monastery is said to be the largest monastery in the world, housing over 10000 monks and governed 7700 subsidiary monasteries and was divided into four colleges, each with its chanting ball, dormitories, kitchens and offices. It was founded in 1416 by the disciple of Je Tsonkhapa, founder of the Yellow Hat Gelukpa Sect of Tibetan Buddhism. The second, third and fourth Dalai Lamas lived and were entombed here. The entire monastic communities assemble only for special ceremonies and festivals. Today, about 400 monks lived there. Approaching Drepung, you will see the Nechung Temple, the home of the State Oracle the present oracle lives in India.